3-room apartment 42 m2, on the top floor. Spacious and bright, practical and comfortable furnishings: entrance hall. 2 rooms with sloping ceilings, each room with 2 beds and satellite TV (flat screen). With sloping ceilings, large kitchen-/living room (oven, 4 ceramic glass hob hotplates, microwave, freezer) with dining table, 1 double sofabed and satellite TV (flat screen). Bathroom, shower/WC. Facilities: Internet (WiFi, free). 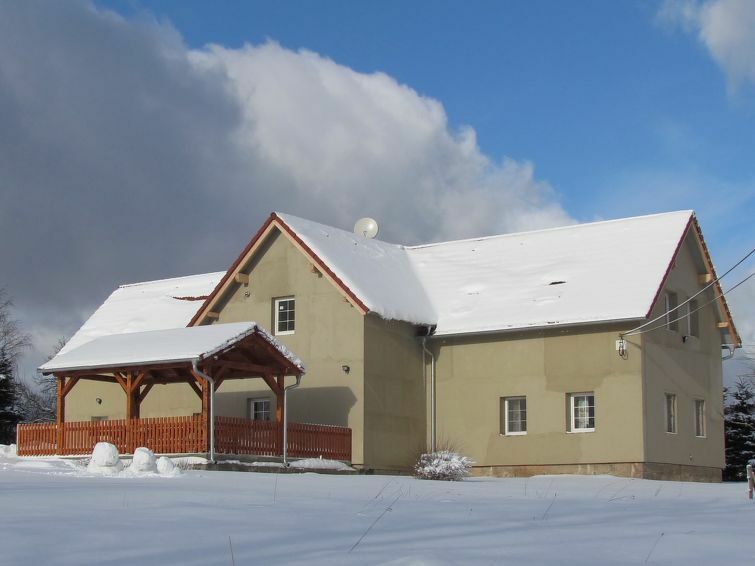 Filipov 3 km from Česká Kamenice: Large, comfortable country house České Švýcarsko, renovated in 2016. On the outskirts, in a quiet, sunny position, in the countryside. For shared use: garden 2'000 m2 (not fenced) with lawn. Patio, pergola, garden furniture, barbecue, fireplace (sandbox). In the house: WiFi, sauna (extra). Fitness room, table tennis, billiard table, table football, trampoline, storage room for bicycles, storage room for skis. Parking at the house. Shop 2.5 km, supermarket 3 km, restaurant 2.5 km, bus stop Česká Kamenice 3 km, railway station Česká Kamenice 3 km, outdoor swimming pool 3 km, indoor swimming pool 18 km. Nearby attractions: České Švýcarsko National Park 20 km, ZOO Děčín 23 km. Please note: suitable for families, suitable for seniors. There are more similar properties for rent in this same residence. Property ref. CZ4072.300.2 is situated on the same property. Wir trafen sehr freundliche Vermieter an, eine erstklassige Ausstattung der Ferienwohnung, hervorzuheben ist das zusätzliche Angebot von Hobbyraum und Sauna - alles sehr sauber! Von hier aus waren wunderschöne Wanderungen oder auch Klettertouren in die phantastische Umgebung der Böhmischen und Sächsischen Schweiz möglich.